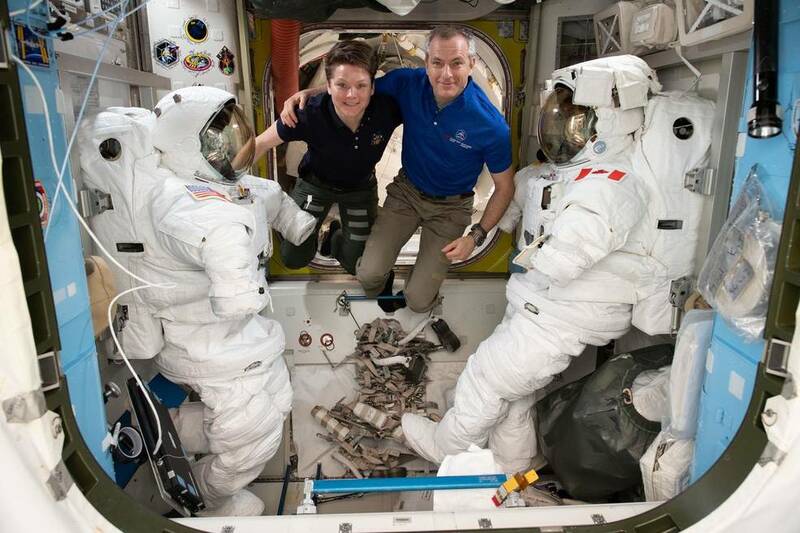 Astronauts (from left) Anne McClain and David Saint-Jacques are pictured in between a pair of spacesuits that are stowed and serviced inside the Quest airlock where U.S. spacewalks are staged. | Photo: NASA. Experts will preview the work of the first two spacewalks during a news conference Tuesday, March 19, at 11 a.m. PDT, at NASA’s Johnson Space Center in Houston. Live coverage of all three spacewalks will begin at 6:30 a.m. on the respective day of the spacewalk. Designated as U.S. spacewalks 52, 53 and 54, each is expected to last about 6.5 hours. The first spacewalk is scheduled to start at 8:05 a.m., while the second is set to start at 8:20 a.m. A targeted start time for the third spacewalk will be set closer to the activity date. he batteries were transported to the station in September aboard the Japanese H-II Transfer Vehicle. The spacewalking work continues the overall upgrade of the station’s power system that began with similar battery replacement during spacewalks in January 2017. Hague and David Saint-Jacques of the Canadian Space Agency are scheduled to conduct the April 8 spacewalk to lay out jumper cables between the Unity module and the S0 truss, at the midpoint of the station’s backbone. This work will establish a redundant path of power to the Canadian-built robotic arm, known as Canadarm2. They also will install cables to provide for more expansive wireless communications coverage outside the orbital complex, as well as for enhanced hardwired computer network capability.